Is there a better way of discovering the tried and tested tricks of the trade, the old tips, and the new ideas, than spending a quiet moment or two reading the musings of experienced gardeners, conveniently condensed into relatable, entertaining articles? We think not. We’ve done our research and analysed dozens of different blogs to find our favourites; why not take the time to browse through a few of their posts? You’re guaranteed to learn something. So, without further ado, let’s dive right into our (in no particular order) list of brilliant bloggers. A grow-your-own enthusiast living in Cardiff, Richard is passionate about cooking with fresh, delicious ingredients cultivated in, and harvested from, his allotment. Attributing his fervour in no small part to Carol Klein’s 2007 Grow Your Own Veg BBC series, Richard’s gardening blog is light-hearted and easy-to-read, whilst remaining a goldmine of important information for vegetable growers. Covering all aspects of allotmenteering, from tools and equipment, to seeds and plants, to relieving raised beds of persistent weeds, Sharpen Your Spades should be the first port of call for anyone who’s recently had the pleasure of acquiring their first plot. And, for the seasoned veteran, healthy, heart-warming recipes are aplenty; so too are book reviews, nifty DIY tricks, and philosophical reflections - this blog has it all. Plus, in much the same fashion as friendly warnings, sensible suggestions and priceless pointers are shared by allotment communities up and down the country, Richard’s monthly serial ‘10 Highlights from the grow your own blogs’ spreads forth knowledge from a whole host of different gardeners with the admirable aim of providing his readers with the best possible information - we highly recommend you check these out. So, you’re a tad short on time? 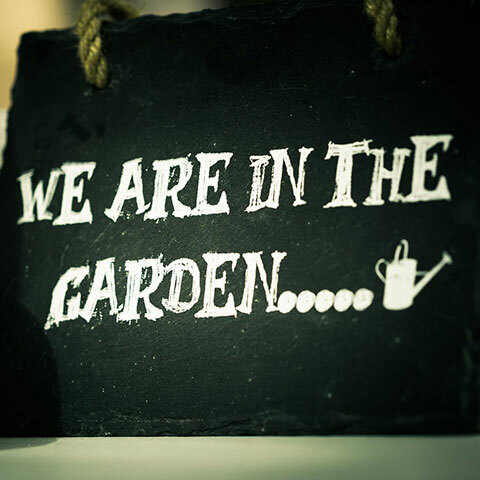 Not enough hours in the day to look after your garden? We’ve heard it all before. Dan’s immaculate garden demonstrates that balancing a demanding full-time job (not to mention four hours commuting every day) with creating a stunningly impressive outdoor space is indeed possible. After perusing through a few of Dan’s posts, you’d be forgiven for feeling a pang of jealousy every time your screen becomes awash with vibrant coloured flowers or displays his impressive outdoor kitchen. However, his garden didn’t always look so impeccable - this post explains how he completed the transformation, and decisively proves that effort, determination and hard work can work wonders. As well as sharing ingenious tips, especially for urban gardening, Dan’s more than happy to take us along with him as he visits the country’s most magnificent gardens, and to share the highs and lows of investing so much time and enthusiasm into flowers, plants, and design. His posts are a reminder that everyone experiences disappointments - a vegetable crop failing, bad weather killing flowers - whilst emphasising the importance of carrying on, no matter how frustrating such events can be. Gardening runs through Matt’s veins. His grandfather and great-grandfather were both talented professionals (hence the blog’s name) and, though his love for gardening was temporarily eclipsed by gaming and computer programming, he’s now committed to spreading his extensive knowledge to the masses. Matt’s blog includes advice for budding allotmenteers and garden designers alike; and, from the photographs of his vegetable patches and flower beds, we reckon he’s mastered both disciplines. What’s refreshing about Matt is his devotion to sticking up for the little guy - he brings important issues to the public eye with the sole aim of protecting those lacking in experience from making regrettable decisions. One such account discusses the fake rainbow seeds which fooled many an over-eager gardener. Another poignant post highlights the ever-growing vandalism and theft epidemics sweeping through the nation’s allotments; we could all be doing more to combat these crimes. Moreover, not content with solely writing conventional articles, Matt has also published a fascinating series entitled Medieval Grow Your Own, which discusses the horticultural tips of years gone by. Thou art a fool unless you take a look at these blasts from the past. A self-confessed ‘plant obsessive’, Helen’s friendly style of writing is so relaxing - a real joy to read. Plus, I think many of us gardening enthusiasts share her dream of retiring in favour of launching our own nurseries; but, alas, sometimes things just aren’t meant to be. Perhaps one day? We can all dream. Anyway, if you’re searching for some garden inspiration, or perhaps a couple of new flowers to add to your collection, be patient and immerse yourself in Helen’s blog – you’re bound to find something exciting. In particular, two of her serials really captured our imaginations. Firstly, we love her ‘End of Month View’ posts - just try not to feel too jealous when comparing your efforts to her stunning garden! And, secondly, Wordless Wednesdays. After all, they do say a picture is worth a thousand words; of course, when presented with Helen’s stunning images, it’s hard to disagree! Despite winning numerous awards, and having her posts mentioned by huge companies multiple times, Helen’s work remains down-to-earth, laid-back and informal - just take a look at this beautifully simple hand drawn garden plan - how refreshing is that? It certainly motivates us to get to work in our gardens. Undoubtedly the most dynamic duo in all of horticulture, Agents Sophie and Ade share a mixture of allotmenteering, gardening, and cooking advice on their fabulous blog. Their mission is simple: to dig, to grow, to harvest, to eat. And they take us along with them every step of the way. Though the writing style is casual, extremely engaging, and laugh-out-loud funny, our agents don’t shy away from discussing more serious topics such as sustainability. Educating their readers on the damaging effects of corporate greed and our wasteful society without taking themselves too seriously is no mean feat; you simply have to admire these two. So, whether you’re in search of a splendid new dish to have for dinner this evening, unsure of which gardening tasks you should be doing this month, or you just need a little uplift after things haven’t quite gone your way, you’d be wise to consult the Agents of Field. As for the future, who knows what’s next for these two - will they ever defeat the evil of industrial agriculture? We certainly hope so. So, that’s our list of the best gardening blogs in the UK. What do you think of them? Are there any blogs you feel we may have missed? Any articles you found particularly useful? Don’t be shy, let us know in the comments section below; we’d love to hear your thoughts.